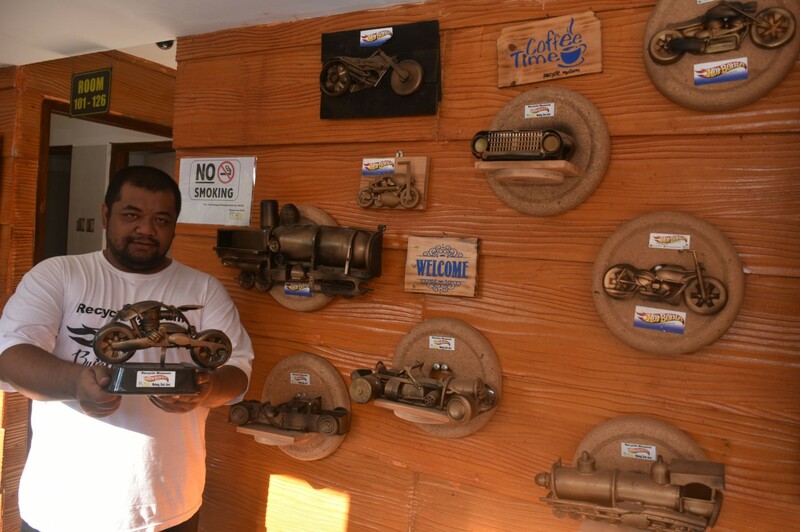 Gold and copper dominated the colors of car and motorcycle miniatures, as well as replicas of robotic animated superheroes on the walls of a tourist cottage front office in Mulyoagung village, East Java, on Sept. 7. All surprisingly made of recycled plastic bottles and other plastic trash. From plastic bottles, the cottage owner, M. Taufiq Shaleh Saguanto, 39, was reportedly able to purchase 50 percent shares of a hotel. Previously a property businessman, Taufiq has been focusing on making transportation vehicle miniatures and robot replicas made of recycled plastic bottles since 2015 after his business went bankrupt. “Our products have been marketed abroad to Canada, Russia and Australia, with production reaching 100 miniature products per day,” said Taufiq, adding that 90 percent of the materials used were plastic bottles, with prices starting at Rp 50,000 (US$3.36) for each item. “It only takes five to 10 minutes to make a product; we’re thinking about using eco-friendly paint that is safer for children,” he said. Up to 60 designs of miniatures of all sizes are available for sale, said Taufiq, adding that he also conducts workshops that urge people to stop using plastic bottles and inspire them to become entrepreneurs utilizing trash.